Esteemed academic Professor Stephen Sterling awarded a National Teaching Fellowship in recognition of his work to promote sustainability in education. Professor Stephen Sterling, Head of Education for Sustainable Development at Plymouth University, has worked over many years on an educational response to the global issues of sustainability which are increasingly characterising our times. 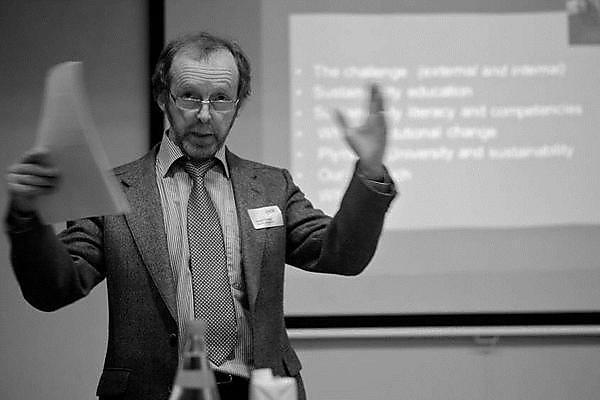 He has worked as a lecturer and teacher, been deputy director of a national educational body, and served as a consultant (particularly to WWF-UK), building a substantial reputation as one of the most eminent leaders on the theory and practice of sustainability education. Professor Sterling has also spearheaded Plymouth’s drive to become a sustainable University, which has seen it ranked among the national top two in the People & Planet Green League, and among the global top 10 in the UI Green Metric tables. The Students’ Union also recently received the highest award possible from the National Union of Students (NUS) in recognition of its green efforts. Professor Sterling’s most notable successes during his career include co-founding/writing the first masters course in the UK on education for sustainability, co-editing the first book published anywhere on this field, and leading on another three key books in the field. He also led the HEA-commissioned Future Fit Framework, which has inspired academics and whole universities to embrace sustainability in their teaching. In 2014, 55 higher education staff have been awarded National Teaching Fellowships, the most prestigious awards for excellence in higher education teaching and support for learning. They were chosen from over 180 nominations submitted by higher education institutions across England, Northern Ireland and Wales, and each will receive an award of £10,000 to support their professional development in teaching and learning or aspects of pedagogy. The scheme is funded by the Higher Education Funding Council for England, the Higher Education Funding Council for Wales, and the Department for Employment and Learning in Northern Ireland, and is open to staff whose teaching or support roles enhance the student learning experience at institutions in England, Northern Ireland and Wales.